Only the most debauched of the devout stand between a Norse demon-god and the apocalypse in J.T. Petty’s Hellbenders. Do you know where that rosary’s been? PLUS: Sergio Stivaletti explains why his ambitious effects for Demons and its sequel were a game changer in Italian cinema, and more! 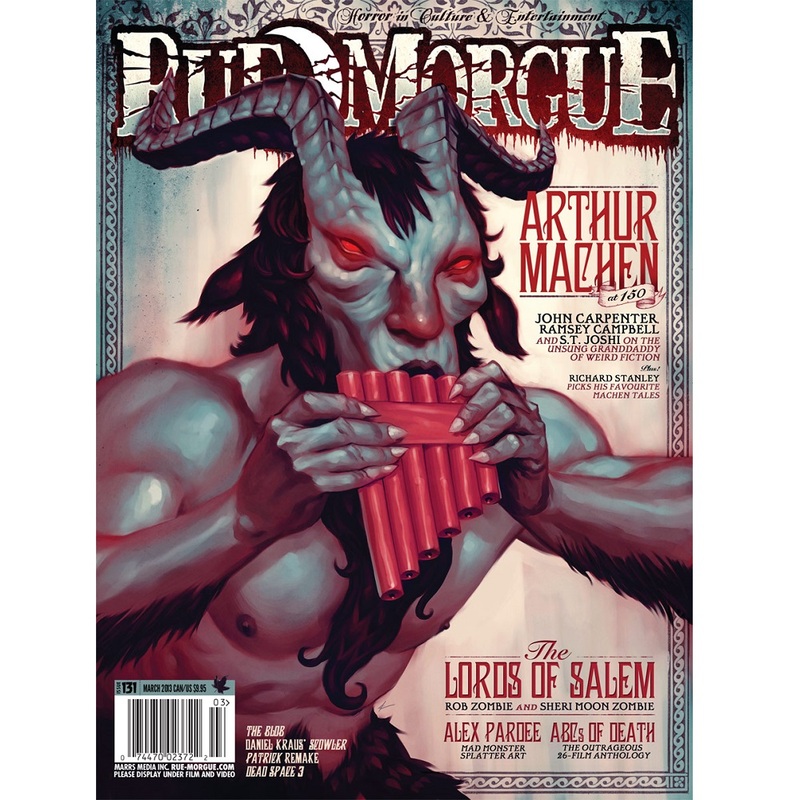 Rue Morgue’s resident coroner, Last Chance Lance, takes a look at different funeral customs from around the world. PLUS: Reviews of Paul Koudounaris’ Heavenly Bodies: Cult Treasures & Spectacular Saints From the Catacombs and the death-themed issue of Lapham’s Quarterly. Midnight Madness, the genre junkie portion of the Toronto International Film Festival, turned 25 this year, we give you a sneak peek at both the horror titles that premiered there, and the other global terrors unleashed. Rob Kuhn’s Birth of the Living Dead documentary traces the explosion of zombie culture back to its Romero roots. Grand Guignol theatre makes a comeback in Paris; Kill your friends in new dungeon monster game; Original Svengoolie, Jerry. G. Bishop, dead at 77. Weird stats and morbid facts. Sick Top Six: Monsters of the Cloth. Garden Nightmares, Custom White Bronze Skull Ring, Tentacle Doorstop, Pacific Rim Action Figures. CineMacabre features reviews of Curse of Chucky, Argento’s Dracula 3D, Devil’s Pass, Hidden in the Woods, Butcher Boys, No One Lives, Alyce Kills, The Vampire Diaries: The Complete Fourth Season, The Legend of the Psychotic Forest Ranger, Fear the Forest, and Last Kind Words. Reissues reviews Day of the Dead (1985), Snuff (1976), Prince of Darkness (1987), Mystery Science Theatre 3000: The Movie (1996), In the Mouth of Madness (1994) and The Amityville Horror Trilogy. In The Vault: The Blancheville Monster. Features Rex: Zombie Killer, plus reviews of Baltimore – The Infernal Train #1 of 3, The Mocking Dead #1, The Halloween Legion HC, Love Stories (To Die For) #1, and Classics Illustrated Deluxe #10. Spotlight: Devil’s Advocates film book series. Library of the Damned cracks open Stephen King’s Doctor Sleep. Plus, reviews of Nicholas Kaufmann’s Dying is My Business, Alison Littlewood’s A Cold Season, Encounters with Flying Humanoids: Mothman, Manbirds, Gargoyles & Other Winged Beasts, Mick Ridgewell’s Evil Never Dies, Tales of Jack the Ripper, Barbie Wilde’s The Venus Complex, Bewitched Again: Supernaturally Powerful Women on Television 1996-2011, and The Haunted Mansion Project: Year Two. On Display: Dirty Donny’s Metallica pinball machines. Featuring the music videos of Phil Mucci. Listen to My Nightmare spins Michale Graves’ The Lost Skeleton Returns. Plus reviews of Re-Animator OST, Castlevania: Lords of Shadow OST, Harley Poe, Unmothered, Salem Rages, The Nearly Deads, Ghoul, Coffins, and Carcass. Features reviews of Amnesia: A Machine For Pigs, Rain, Ravaged Zombie Apocalypse, and Catastrophic Zombies! The Alan Parsons Project’s Tales of Mystery and Imagination: Edgar Allan Poe. 15 new subscribers will win a copy of Lizard Man: The True Story of the Bishopville Monster, courtesy of Anomalist Books.